GE turned to Edelman to craft a new strategic approach to messaging on an upcoming union vote. When thousands of unionized General Electric employees had a labor contract vote coming up, the company needed a fresh approach to reach its workers since the previous vote four years earlier. Changes to communications, including the rapid rise of social media, and business, such as healthcare costs, forced the company and its agency, Edelman, to seek a new strategy. Research showed GE’s union employees received negotiation-focused news primarily from union blogs, Twitter, and at work. The information was generally negative about GE. So GE and Edelman focused on providing context for upcoming contract changes, introduced an integrated communications approach to the negotiations, and supported company leaders’ transparency so voters would want to choose yes. One judge called the effort "awesome," noting how complicated union communications and engagement can be. Another judge said it was "strategic handling of an otherwise sensitive issue." An app and website specifically for employees to follow during the negotiations were released long before the actual deliberations kicked off. 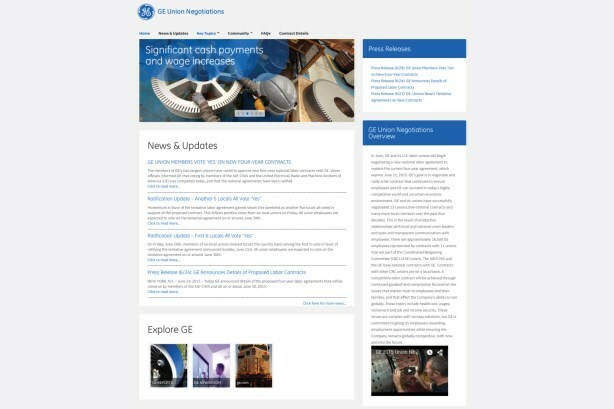 The website not only walked employees through issues, it also allowed GE to cut through any misinformation. Given its role in getting information out to union employees, the website worked like a newsroom, replete with an editor-in-chief, who supported the real-time outreach effort. The pair’s approach also spanned in-person meetings and actually talking to employees. "This was a shining example of what a campaign should be," said one judge, while another lauded the effort for "owning the narrative about the value of a job by taking it directly to employees to break through." There were more than 65,000 site hits that included nearly 50% of users doubling back to use the site. Ultimately, the 2015 contract was ratified with an overwhelming "yes" vote. The need to emphasize the importance of its 1.3 million employees was the impetus behind this Walmart effort, which was assisted by Burson-Marsteller. While improving the customer experience was certainly a goal, as well, Walmart truly sought to make the lives of its staff and related communities better. The company’s associates played a key part in the campaign, selecting the tagline, "Serving Our Customers. Better Together." Awareness efforts, storytelling, online outreach, engaging leaders, and celebrating and inspiring success followed, all of which served to further excite the associate base.